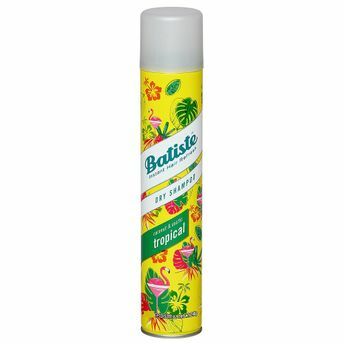 Caribbean heat, coconut aromas and party vibes are locked into this Batiste Dry Shampoo Instant Hair Refresher Coconut & Exotic Tropical. It’s the instant, deliciously exotic way to get clean, fresh hair full of body and texture. And there’s no need for water! It refreshes your hair between washes, leaving it feeling gorgeously clean and fresh. A few sprays of dry shampoo is a convenient, quick way to instantly refresh your hair feeling clean, fresh and full of body and texture. Innovative formulation "no water needed" targets excess oil and grease, helping to eliminate it at the roots, perfect for use between washes. Gives dull, lifeless hair the makeover that it deserves without water, perfect for travel, toss in your bag and go. Bottle of batiste dry shampoo with a coconut & exotic tropical fragrance. Additional Information : Enliven your lifeless hair with the UK's number 1 dry shampoo, Batiste has a wide range of products to keep your hair fresh and gorgeous looking everyday. For over 40 years Batiste has been creating top quality hair care products for use between washes when you need a quick fix, but still want your hair to look amazing. Whatever your hair style, type or color, Batiste has a product for you. Batiste dry shampoo refreshes your hair between washes, leaving it feeling gorgeously clean and fresh with added body and texture. No water required!